The prospect of buying a new home and moving in is exciting! But before you get too ahead of yourself, make sure you that take the time to ask the realtor or current homeowner about a few things. After all, no home is perfect. Getting information on possible issues upfront is always better than buying the house on a whim and discovering a problem a few months in. 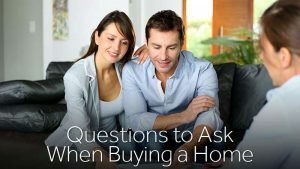 Here is a list of some questions you should be asking when buying a new home. Replacing a roof is an expensive project, about $7,600 on average, to be precise. Even if the roof appears to be fine, have a contractor come out and inspect it. If there are problems with the current roof when you purchase the home, you can ask the seller to cover the cost of replacement. Also, knowing the age of the roof will help you plan and budget for its eventual replacement. On average, an asphalt shingle roof needs to be replaced every 24 to 30 years and wood shingle roofs should be replaced every 20 to 40 years. Past infestations should be disclosed by the seller during the sales transaction. Even if they hired a pest control professional, this does not guarantee against a repeat incidence. Knowing the past problems allows you to prepare the home and correct whatever conditions existed to attract the pests in the first place, like sealing any openings, repairing leaks and replacing any rotting wood. It might also be a good idea to ask your new neighbors what their experience has been as some pest infestations can be neighborhood wide. Finding a beloved pet that has been buried in the back yard can be disconcerting, to say the least. It is better to know up front so that the remains can be removed or the area avoided before you dig to plant a tree or garden. Take a look around the property. Do you see any trees or other plants? Well, as these plants grow, their roots can find their way into the sewer lines that run under your house. If they get in too deep they can actually cause the pipes to burst, causing a big mess when the sewage backs up onto your property. Ask the homeowner if there has ever been an issue with the sewer lines so you have an idea of whether you need to keep an eye on the underground roots. How Big Is The Water Heater? Nothing causes a family feud faster than soaking up the last of the hot water when there’s someone still waiting to take a shower. 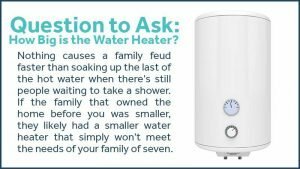 If the family that owned the home before you was smaller, they likely had a smaller water heater that simply won’t meet the needs of your family of seven. This is also a good chance to check on the age of the water heater. Even if you have the right size, they’re only designed to work for about 13 years or so. It’ll be good to know whether yours will need to be replaced soon. Once you get all your questions answered and make an offer on the house, things will start moving quickly. Keep your moving day under control by working with Zippy Shell. We take all the stress out of moving day and do it for about 20 percent less than other moving companies in the area. Contact us today to find out how our portable moving and storage services can help make your move easier. Rent Vs. Buy: What's A Millennial To Do?